I absolutely enjoyed the interactions with you. There are some interesting questions, some interesting insights. Hello everyone Welcome back to the study plan First of all I would like to thank you all for your active participation on the webinar which we had in the last week I hope you all thoroughly enjoyed interacting with the Professor Coming back to our Week 5, the theme for week 5 is building peer networks. The key topics that would be discussing in this week are peers are significant stakeholders, influencing peers, and how to build effective peer relationships I would like to remind you all that please don’t forget to attempt the review questions. Third one, because of these expectations, inter-dependencies, and deliverables, a lot of time is spent both in managing conflicts and also ensuring co-ordination between peers. 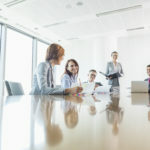 It’s quite clear that professionally if we have to meet organizational goals, which are delivered by different departments across the organization, and we need to accomplish coordination across these different departments, it’s important for each one of us that we recognize the role that our peers play. In every program that I conduct, people ask me, “How do I hold someone accountable who does not report to me?” Okay really what people are saying is, “I have no influence or no power over my peers. With your peers, what is the kind of power that you have? I want you to take a few minutes to just think about, “If I have to influence my peer, what are the kinds of power that I need to demonstrate?” I’d now like you to do an exercise. Take a few minutes, and think about the times that you’ve been able to influence your peers positively. Aware of the partner’s strengths and weaknesses, which means that…two important questions, are you aware of what are your strengths and weaknesses? Are you aware of what are your peer’s strengths and weaknesses? Do your strengths complement your peer’s weakness? Do your peer’s strengths complement your weaknesses? This understanding and self-awareness is critical to strengthen partnerships. The first is, play to the strengths of the partner, and the second and the most important one is, look for the positives in the partner. Several years later the feedback that I received from that peer continues to influence me in several of my assignments even now, because I go back to asking this question, “Did we gain professionally and personally from this partnership?” Managing conflicts: Not all conflicts are bad. In fact, work-related conflicts are necessary and essential to think differently, to bring in different perspectives. Often when there is a conflict, we tend to label those conflicts as personality conflicts, which is why when you’re dealing with peers and engaging with them, you’ve got to step back and think of conflicts largely from task, work-related, deliverables-related. What does this really mean? I mean, in my experience, as the environment changes and becomes more complex, and as organizations demand more and more from employees, and as the nature of solutions that clients and customers are expecting keeps changing, and as technological disruptions begin to happen; I truly believe that peers are the only stakeholders who can help you to be on your toes all the time. When your organization talks about innovation, and they are talking about disruptions, and they are talking about how can you create value for the organization; remember the sure-fire way to create value for the organization is through strong peer networks and collaboration. You know, becomes a, the type and the intensity of the work also, prevents that but what we do, sometimes, we reflect on certain thing which is not, which probably should have done in a better way. Managing… Mr. Subbiah: Managing peers is, you know, is a challenge of its own kind, you know. You know, kind of, struggled and burnt fingers in certain incidents and certain instances. Prof. Vasanthi: Is there something that you can really talk about, which is, why are there these challenges in interdepartmental coordination? What do you think are one or two reasons? Mr. Subbiah: So, I would say, you know, even though we understand that any organization, you know, not only Enable India, any organization that works on a, works for a common goal but sometime there is a lack of clarity on, you know, certain common goal, no. What I perceive as a common goal, you might perceive as, you know, something, which is not, you know, or at the same degree, there might be a perceptional thing, right? Prof. Vasanthi: Okay. Mr. Subbiah: And there will be your own, you know, priorities, according to your own department, right? Prof. Vasanthi: Sure, sure. Mr. Subbiah: And another challenge, I feel, is resource, you know, resources crunch. Prof. Vasanthi: Correct Mr. Subbiah: So, that’s where the, you know, some conflicts and those thing come, right? Mr. Subbiah: So, we had our own mechanism of sorting out those kind of. Prof. Vasanthi: Yeah, just one minute, okay? See, very interestingly three key things that you have mentioned in terms of inter-departmental coordination, and I am sure several of the participants on this course will also be kind of having the same problems, is that-yes, we do have a mission of the organization, the vision, and the common goals but there could be a lack of clarity in terms of how each of us understand those goals. What has been, how have you managed this interdepartmental coordination? Mr. Subbiah: See, initially I had some really, you know, some challenges with interdepartmental challenges, you know, things. Sometimes when the resources or anything to be shared that becomes a challenge, right? So even, the ideal thing is, no, to sort out between those two managers and those need to sort out what is a priority and. Mr. Subbiah: Correct, correct, correct! Then, you know, we, I actually then understood, okay let’s take this, you know, this peers not talking to the peers and see, you know, whether that can be sorted out and those thing. Mr. Subbiah: And what has worked for me currently, you know, I don’t know whether it will work in future but at least currently, it is, how it is working out for me, having a clear-cut plan.